Star2Star Earned the 2018 Excellence Award! 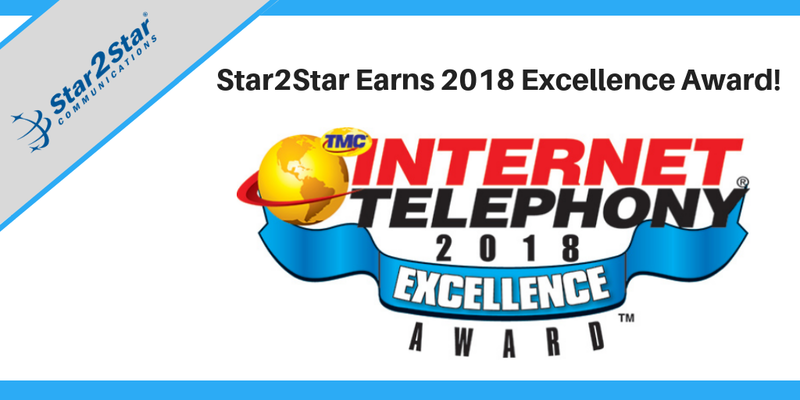 November 28, 2018 – Star2Star Communications, a leading VoIP service provider for voice, video, fax, instant messaging and presence management, announced that TMC has named their Full Spectrum system as a recipient of the 2018 INTERNET TELEPHONY Excellence Award presented by INTERNET TELEPHONY magazine. The Full Spectrum solution is designed to deliver exceptional VoIP services and end-to-end Unified Communications features. This solution delivers multiple deployment options, built-in business continuity and an advanced suite of features. Businesses are able to choose the best system to fit and customize for their unique needs. “Here at Star2Star, we prioritize the quality and reliability in our systems over all else. This is why we are able to guarantee 99.999% uptime and provide the industry’s most flexible communications system,” said Michelle Accardi, President and Chief Revenue Officer at Star2Star. Congratulations Star2Star! We are honored to partner with an innovative service provider that demonstrates outstanding quality solutions for our customers!